Global Health Scholar, Michelle Ferng, was selected as the 2014 recipient of the JohnsHopkins-Pulitzer Center Global Health Reporting fellowship. A gradiate of the MSPH degree program in Health Systems, Ferng explored the issue of elder abuse, doing her field reporting in Peru. Click here to read Michelle's piece Silent Crimes published in the JHSPH Spring 2015 Magazine. The brick walls are crumbling. The roof leaks. A stale, slightly rotten odor permeates the tattered room. A modest bed, an antique dresser, a wooden table and a few fading portraits stand awkwardly in the repurposed space—once the entrance hall of the single-story house. 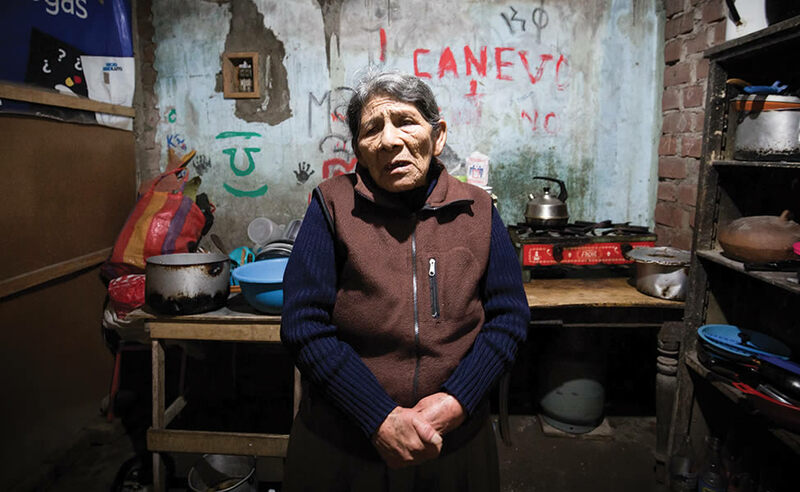 Waving her trembling fingers, perpetually swollen from years of washing clothes and housecleaning, 76-year-old Josefina Womani Espinoza points at a closed door at the far end of the long, dim passage. The door guards the world of her children and their families. Over the years, they appropriated one room after another. Finally Espinoza was left with a small corner of her own house. 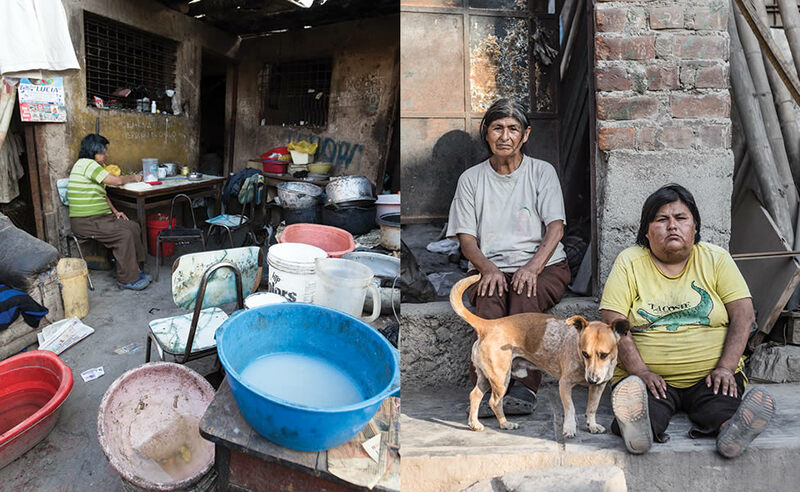 Out of necessity, the mother of seven supports herself by doing menial chores for neighbors living in the surrounding peri-urban neighborhood of Lima. She cooks alone, eats alone, works alone and spends most of her spare time alone. Sometimes her family enters to take her food or small personal items. Sometimes they pass through to exit. But mostly, she says, they just pretend she doesn’t exist. As if to illustrate her point, a young man walks through the conversation and leaves the house without even a nod of acknowledgment. Espinoza’s permanently furrowed brows sink deeper into their creases. Espinoza is one of an underreported epidemic: older adults worldwide suffering from abuse and abandonment, often by those closest to them. The majority of victims remain hidden from public view. Only rarely do extreme cases command attention. Longevity, once hailed as a milestone of human achievement, is now showing an ugly side. In a nod to the challenges of “the neglected stepchild of the human lifecycle,” a November 2014 Lancet series highlighted the inadequacy of societal and public health responses to the growing needs of aging populations worldwide. In many ways, time is running out. Between 2000 and 2050, the proportion of the world’s population over 60 years old is projected to double from about 11 to 22 percent, according to the WHO. One million people turn 60 every month, and 80 percent of these are in the developing world. One of the most tragic facets of the coming demographic shift is elder abuse, which can take various forms: physical, psychological/emotional, financial/material and sexual, as well as abandonment or neglect. 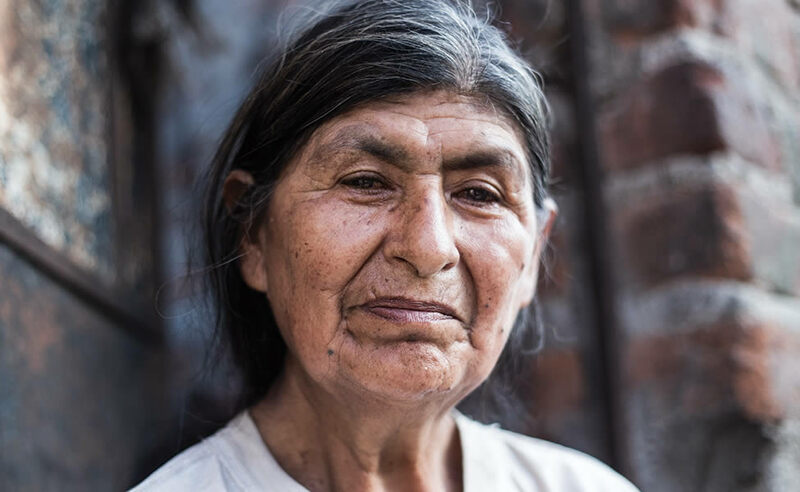 Espinoza’s story takes place in the outskirts of Lima, but her experience is one shared by the growing populations of older adults all over the world. Earlier prevalence studies indicated that, globally, between 4 and 6 percent of older adults have experienced some form of abuse in the home. But more recent studies, media reports, anecdotal evidence and police reports suggest that far more cases go unreported. HUMBLE ABODE: Josefina Womani Espinoza spends most of her time alone in her home in Lima. Home to one of the fastest growing Latin American economies in the past decade and widely known as a gastronomic mecca, Lima has recently emerged as one of South America’s most vibrant cities. Oceanfront high rises overlook the coastline, where fancy new malls cater to the once-nonexistent middle class and trendy restaurants serve up endless plates of fresh ceviche and pisco sours. A shiny new fleet of blue public buses, intended to alleviate the congested urban traffic, is only the latest addition to the city’s public transit expansion. Beyond the rapid development, however, lies a less noticeable reality: the ubiquity of aging older adults working on street corners trying to survive. Often hunchbacked and gray-haired, the older women and men walk miles and miles with heavy sacks of collected recyclables on their backs. They guard cars for voluntary spare change. They sell boiled quail eggs, chicha morada (a traditional drink made with boiled purple corn) and lottery tickets. They shine shoes along the bustling Avenida Abancay downtown. For most, earning a living on the street is a necessity, not a choice. The current state of affairs seems counterintuitive. Traditional Peruvian culture, as in much of Latin America, respects the elderly and requires children to support their parents in old age. A mental health study in Lima and Callao in 1990 found that family cohesion was perceived as the most important source of security for older adults. Religious practice occupied second place. Yet, within the past few decades, all seems to have changed. Large-scale urban migration led masses of rural inhabitants to Lima and other coastal cities, where a new lifestyle chipped away at traditional family relations and brought about a new form of insecurity. Slum settlements known as pueblos jovenes (young towns), formed out of desperation in the periphery of major cities, became permanent fixtures in the urban landscape. Job growth could not keep pace with the massive influx of poor migrants. Most of the newcomers ended up working informally, trapped in poverty with limited access to pensions and health care. “I’m very fortunate that my father fed me well as a child, so I still have good bones in me. But I know that the day I fall ill and can no longer work, my children will abandon me." Like many in her generation, Espinoza became accustomed to long work hours at a very early age. Between cleaning houses and buildings, selling on the street and doing other jobs around town, she found herself increasingly outside the home. According to 2014 figures from the National Institute of Statistics and Informatics (INEI), there are approximately 2.9 million adults over the age of 60 in Peru, representing 9.4 percent of the total population. The proportion of older adults is projected to rise to 22.8 percent of the population by 2050. Today, studies indicate that elder abuse and abandonment are a prevalent phenomenon in Peru. A 2002 household survey in Lima and Callao found that one in four older adults had experienced abuse in the previous year and one in 10 had experienced systematic abuse (i.e., once or twice per month). The most frequent forms of abuse were insults and verbal aggressions (20.9 percent), followed by humiliation, manipulation and extortions (6.0 percent). Six percent had experienced neglect of basic necessities or abandonment in the previous year. More recently, a 2013 HelpAge International survey of older adults in Lima reported that most respondents had experienced unmet health needs, neglect in social care and humiliating treatment because of their age. Unfortunately, for many older adults in Peru and worldwide, abuse and abandonment is more a question of when than if. A few miles from Espinoza lives Maria Concepción Serpa, a quiet 73-year-old woman with a natural grace that belies decades of hardship. Three-foot mountains of scrap fill the house’s front courtyard—leftovers from years of recyclables collection in the slum. Despite the chill in the September air, flies buzz around plates of half-eaten porridge on the wooden table, littered with empty pill packets and a worn Bible. The atmosphere is deceptively calm. Her daughter also suffers from schizophrenia and beats her. All three of her adult children are incapable of work and rely on their mother for survival. Despite the decades of abuse, Serpa does not blame her children. Instead, she focuses on their health, the unaffordability of drugs and the difficulty of survival with no support. “As people get older, they are discriminated against or abused not only by relatives … but by the system—by not having pensions, by not having proper access to health care, by being denied a bed because a patient is old and they need a bed for a younger person,” notes Silvia Perel-Levin, chair of the UN NGO Committee on Ageing and co-author of the 2002 WHO Missing Voices report—the first study to collect the views of older adults regarding elder abuse. BLEAK FUTURE: Leftovers from years of recyclables collection clog Maria Concepción Serpa’s compound (left). Concepción Serpa shares a calm moment with her daughter, sitting outside their home on the outskirts of Lima. Peru had one of the fastest growing economies in Latin America over the last decade, yet by multiple definitions the country continues to exhibit one of the higher rates of informal labor in the region. The result? Limited social security coverage for older adults, who are disproportionately affected by inadequate social safety nets. Quality long-term care remains a significant challenge, and one in every four older adults remains without any health insurance. In an attempt to address poverty in old age, the Peruvian government introduced in 2011 the Pension 65 program—a noncontributory social pension that transfers 250 Peruvian soles (approximately US$85 or 7.6 percent of average income in Peru) every two months to older adults in extreme poverty. But despite its success and planned expansion, the program has not reached many of the most vulnerable, due in part to means testing requirements and enrollment problems. Sitting on the front steps, staring silently into the empty alley, Serpa contemplates her options. These are her children, and they cannot control their own aggression. Where can she turn for help? Apart from her sister, who occasionally gives her money from her sales of trash bags at the market, her options seem limited. Life has been so for as long as she can remember. Public health advocates note they are challenged by the paucity of evidence on elder abuse and abandonment. Most studies originate from developed countries in North America and Europe, with relatively little evidence from developing countries. In Peru, study findings suggest that the problem is much more widespread than official numbers of reported cases would suggest. Across the country, during 2012–2013, a network of government-sponsored centers for domestic violence received 3,828 cases of violence against older adults—4.2 percent of the total cases. More than 80 percent of the 3,828 cases involved females, and 97 percent were of physical or psychological abuse. Only 127 cases were of abandoned elders. Further muddying the picture is the fact that the very concept of elder abuse has broadened significantly in recent years. Earlier research and initiatives in the field tended to focus on cognitive and physical impairments of the victim—typically a sick, dependent elderly person suffering at the hands of a stressed caregiver. However, recent evidence suggests that older people who are mistreated are not more debilitated than their non-abused peers. Studies have also found that caregiver stress, one of the original explanations for abuse, does not independently explain elder abuse. Unfortunately, the shortage of solid evidence has contributed to an overall lack of awareness and political will among policymakers to effect change. In Peru, at the Department of Older Adults at the Ministry of Women and Vulnerable Populations (MIMP), Ríos runs through the long list of challenges. Understaffing, underfunding, lack of coordination across ministries and actors, lack of awareness among policymakers, poor data collection. Revealing fact: Her department of older adults numbers only 14, while the department of children commands a staff of 75, even though the number of Peruvians over 60 years now outnumbers the number of children under 5, according to the latest figures from the INEI. In 2002, 159 countries gathered in Spain to produce the Political Declaration and the Madrid International Plan of Action on Aging. A landmark event in the movement for older people’s rights, it included the prevention of abuse and neglect as one objective. The agreement, however, is not legally binding and its implementation is voluntary. More than a decade later, many advocates and policymakers are calling for a UN International Convention on the Rights of Older Adults that would require countries to implement policies and plans. Others maintain that the challenges presented by the demographic shift are best addressed through more effective implementation of existing mechanisms. By some measures, Peru is ahead of its peers. In 2006, it passed the National Law #28803, which guarantees the rights of older persons, followed by a National Policy and Plan on Older Adults. “Instead of maltreatment, we want to promote a new culture of good treatment of older adults,” says MIMP director Ríos. ​BEAUTY AMONG TRIALS: Despite dealing with physical difficulties and frequent ageism, Maria Concepción Serpa maintains a grace that belies her hardships. Government ministries in Peru now convene monthly to coordinate implementation of the national plan, organized into four thematic areas: healthy aging; employment, pensions and social security; participation and social integration; and education, awareness and culture on aging and old age. Specific initiatives have included programs for homeless older adults (Vida Digna), comprehensive care centers, differentiated health care in public facilities, and health promotion workshops. The Pension 65 program is being dramatically expanded to cover up to half a million older adults by 2015, up from the 2014 target of 380,000. Additionally, there are plans to strengthen the national elder abuse data and coordination of cases through improved use of police reports and judicial cases involving older adults, says Ríos. Ultimately, at the heart of the issue is: How is old age perceived in society and what can be done to change that perception? The initial scenes showed solitary demonstrators amid a sea of passing strangers. By contrast, the last scenes depicted smiling young men and women warmly embracing the demonstrating older adults. “For this vision to become a reality, we have to transform the mentality of society on what aging is … to revalue the figure of an older adult. Older adults have to be considered as a subject, not an object,” says the Ombudsman Office’s Zegarra Miranda.